Look, it's an army-builder you'll never be able to army-build. Stormtroopers board the Rebel Blockade Runner Tantive IV and send word to Darth Vader that they have captured Princess Leia. Pity the poor toymaker - in addition to meeting government safety standards and trying to predict what properties kids are going to be into, they also have to listen to us whiny fanboys complain about every fricking decision they make (and moreso in regards to Star Wars than any other toyline). 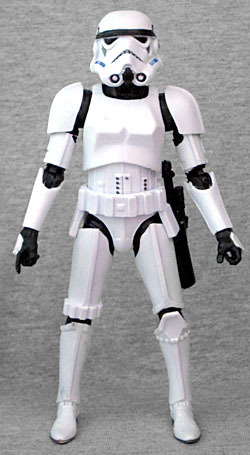 Consider the new 6" Stormtrooper: he's popular, and people want multiples, and thus is rather hard to find; but if there were multiples in a case, we'd be staring at them on the shelves and wondering why Hasbro was dumb enough to heavy-pack something so similar to a figure from Series 1. Unsurprisingly, the majority of this figure's sculpt is shared with the Series 1 Sandtrooper - which may or may not include the helmet. It's kind of hard to tell. 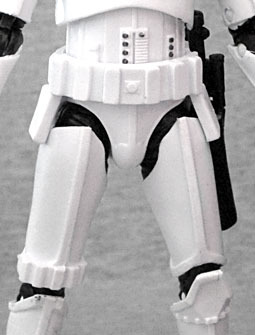 The ear bumps appear to be different, which could be an intentional change (Stormtroopers have three vs. Sandtroopers' four), or it could just be that the molds have been overused. Other than that, the upper torso, arms, thighs, right shin and both feet are all shared molds. That leaves only the lower torso and left shin as new pieces, and those only because there are actual costume differences that needed to be accommodated. 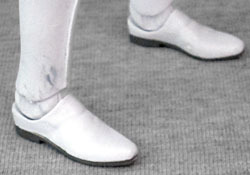 The "sniper plate" on his left knee (so named because it provides extra support/stabiliztion when kneeling to line up a shot) is more ornate than the Sandtrooper's, with a half-diamond outline and a ring of bumps around the front of the leg just below the plate. An extra plate with dark buttons was also added to the abdomen, to create just a little bit of visual interest in the vast expanse of white between gullet and groin. Meanwhile, the belt was redone, adding white drop boxes to break up all the black in the hip region - that means the toy's belt is also new, though the boxes are farther out to the sides here than on the real costume. Since the Stormtrooper is so hard to find, that means you probably won't have the opportunity to compare the paint job before you buy it. Mine has a few random scuffs of black marring the pristine white of the armor, but it's not terrible: he just looks like he's seen some action while on duty. The thin black lines painted in the recesses of his helmet are all remarkably crisp, but the coverage on the "mouth" area is lesss than complete. 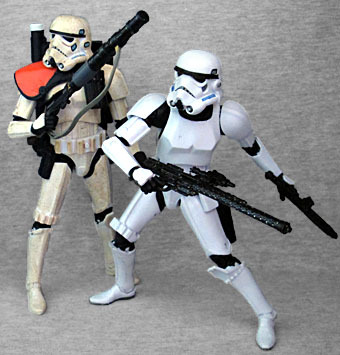 The Stormtrooper only comes with two accessories: a BlasTech E-11 blaster (the "standard" Stormtrooper blaster, based on a Sterling L2A3 submachine gun) and a BlasTech DLT-20A Blaster Rifle (cobbled together from the body of a German StG 44 and the barrel of an M1919 Browning), though that gun is more identified with the bounty hunter IG-88 than the Stormies. The E-11 does fit in the pouch hanging off his belt, though. The toy has a balljointed head, hinged neck, swivel/hinge shoulders (though they're somewhat limited by the bells of the armor), swivel biceps, double-hinged elbows, swivel/hinge wrists (hard to get moving, but they do - the left hinges side-to-side, while the right hinges up and down), a balljointed torso, swivel/hinge hips, swivel thighs, double-hinged knees, and swivel/hinge ankles - in other words, all the same joints as the Sandtrooper. The materials used are the same as well, so if you have that figure, you know what to expect here. With fewer accessories and fewer paint apps, the Stormtrooper isn't as exciting as the Sandtrooper was. But he's still an iconic part of Star Wars, so it's no surprise he's so difficult to find. It doesn't help that most stores still have a lot of Series 2 hanging around (particularly Leia and Greedo), or that Series 3 also includes a rerelease of Han Solo, who wasn't that hard to find in the first place. Meanwhile, the ultra-rare Boba Fett? Nothing. "Thanks," Hasbro.